Chalet Divaria is our summer mountain bike chalet, this property is now in it’s 5th year with MTB Beds and it just keeps improving year on year, recent developments include a professionally built mountain bike wash down station with metal drain grid and Karcher jet wash in the back garden. Chalet Divaria is our flag ship seasonaire chalet in Morzine (we do have others) and accommodates 9 people over 4 spacious bedrooms, 3 twins/doubles and one triple room. Three of the four rooms have direct balcony access and enjoy some of the best view Morzine has to offer looking down towards the town its self and the Pleney Mountain, then across to Nyon and up towards Avoriaz and the vast Portes du Soleil MTB trail network. The chalet benefits from 2 bathrooms and 2 separate toilets which means no queues in the morning. The chalet also has a fully equipped kitchen with new gas hob and electric even, 2 large fridges and the usual microwave, toaster and kettle. There is a huge front room with 3 sofas and plenty of space to relax after a hard day riding bikes or to watch your go pro footage on the large flat screen TV in the lounge area. The property has high speed Internet and great WiFi signal through out the property. The front room and dining area leads out onto a full wrap around balcony that enjoys the same amazing views as the bedrooms on the front of the house. Chalet Divaria is located a 10 minute walk from the very centre of Morzine and only 5 minutes from the first bar, supermarket and Super Morzine lift so its very well located. 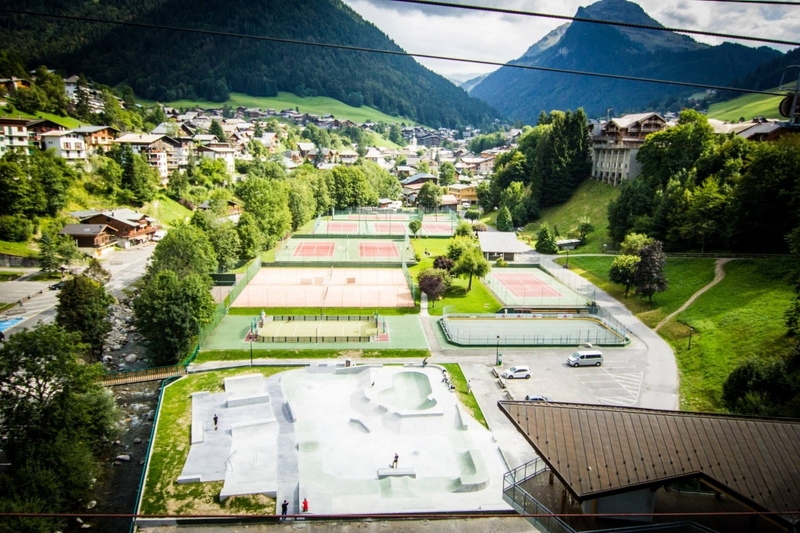 It is situated on a slight hill however you can ride your bike directly back from the Super Morzine trails to the door and you can also roll out of the front door down to the lift so it’s a win win location really. We have spent many seasons now testing this chalet with different ideas and projects to make sure it’s the best mountain bike chalet in Morzine and we feel it is finally there, from the large drying room in the basement to the bike wash area and the secure bike lock up it has everything you need for a full summer season in Morzine. You can rest assured that after a hard day riding your bike in the vast Portes du Soleil this property has got your back when you come home. The property is set up perfectly for Mountain Bikers who want to spend a full season in Morzine and ride the 50 official downhill tracks and the 100's of unofficial trails spread across 2 countries, France and Switzerland with 12 resorts and 600km of trails this place is vast, one season barely seems enough. If it’s the Freestyle course over in Chatel or the steep, rooty secret trails on the plenty that take your fancy rest assured that this place has so much terrain you will never get bored, ever. If you have a trail bike make sure you bring that also as there is some incredible single track riding out there and we are more than happy to show you it. Chalet Divaria is a traditional French Savoyard property with a warm and comfortable feel, located in a small cluster of houses you feel there is always someone about in case of emergency. There is a great garden to the front of the property that can be used by all residents but is mainly reserved for the 2 bedroom apartment that is located underneath the chalet, this has also been used as seasonal accommodation for the past 5 years and we always have a great relation between the top and bottom clients. If you are considering spending a full summer season out in Morzine and looking for a property that has got everything you could need look no further, we are a company owned and run by passionate mountain bikers and know exactly what you need so get on it and book it, 3 months riding bikes, drinking beers and making friends to last a life time. Over the past 7 years we have also developed many relationship with shops, bars, food outlets, transfer companies etc and we like to pass on our discounts to our clients. If you book with us you can expect cheap insurance, discounts from the likes of 5.10 shoes, airport transfer discount codes and much more. It all makes sense. Morzine summer MTB season dates run from the 03rd June - 03rd September 2018 All bills included. It is possible to extend your stay either side of these dates at £10 per person per night.